with the Tiger Eye diamond on the turban ornament. The turban ornament was the most characteristic of all Indian accessories. became bigger and more elaborate in the 19th century. India has been known for its gemstones and jewelry arts for centuries. 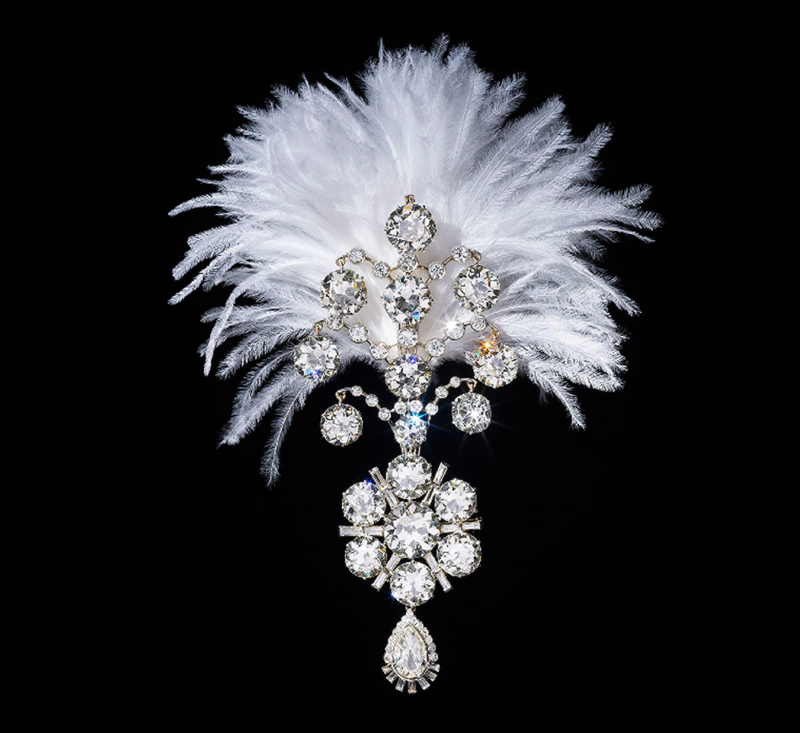 In the exhibition at the Legion of Honour Museum in San Francisco, visitors can now see more than one hundred and fifty precious objects from the collection formed by His Highness Sheikh Hamad bin Abdullah Al Thani, with impressive pieces ranging from Mughal rule in the 17th century to those reflecting India’s influence on today’s jewellers. 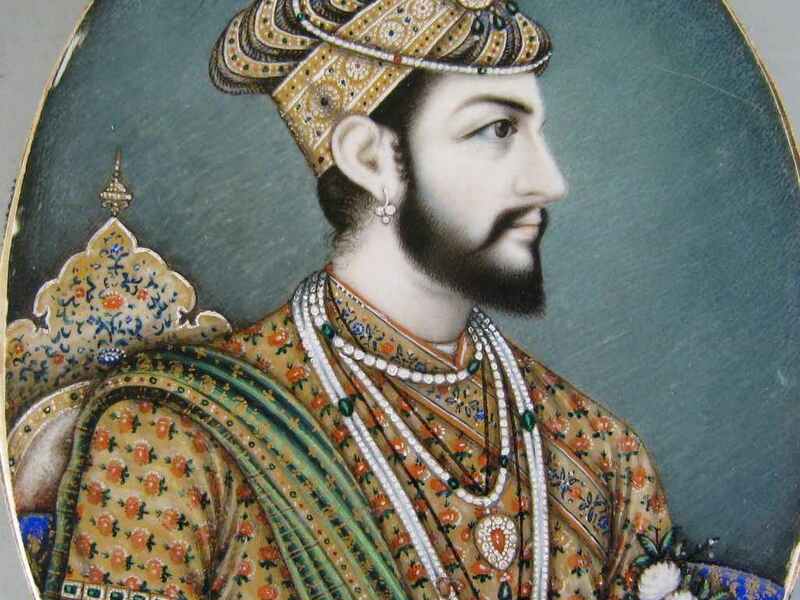 The Mughals, a dynasty with roots in Central Asia, ruled India from 1526 until the establishment of British control, from 1858 to 1947. 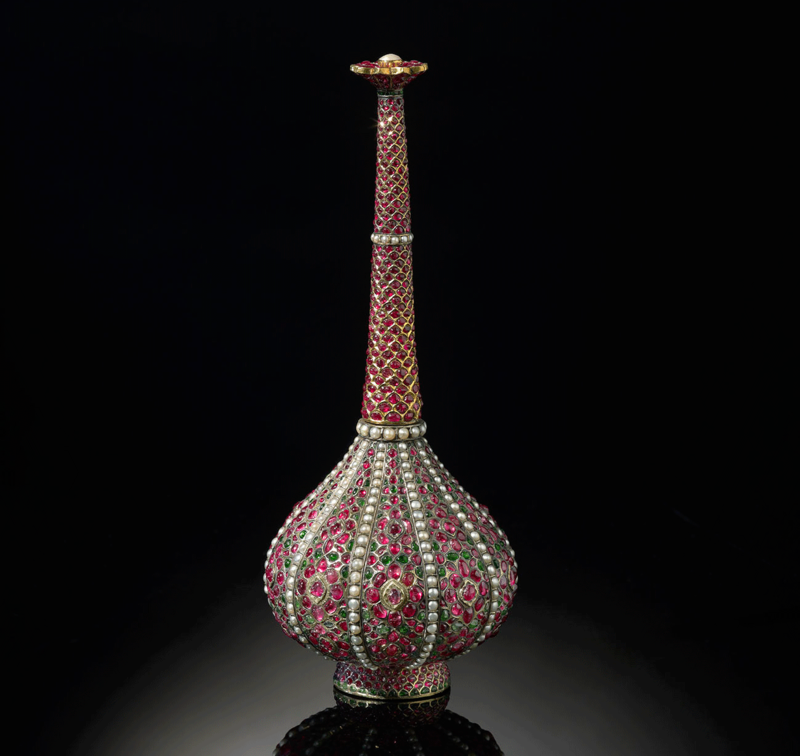 Throughout this time, India was known for its exquisite production of jeweled arts and precious gemstones. Under successive Mughal emperors and the maharajas, Indian jewelry and works of art developed different styles, influenced by the disparate cultures and monarchal traditions of the time. 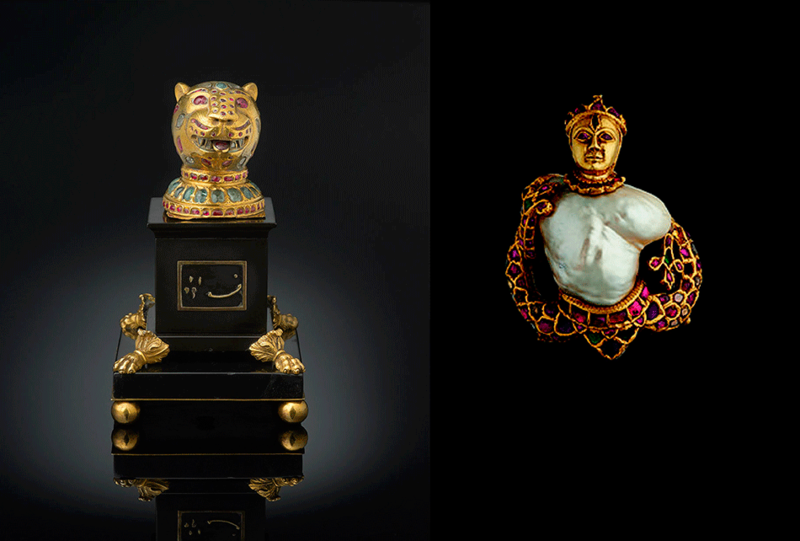 The objects in this exhibition highlight Indian jewelry traditions including pieces worn on ceremonial occasions; weapons such as swords and daggers; and precious works of art made of gold or jade for display or use. 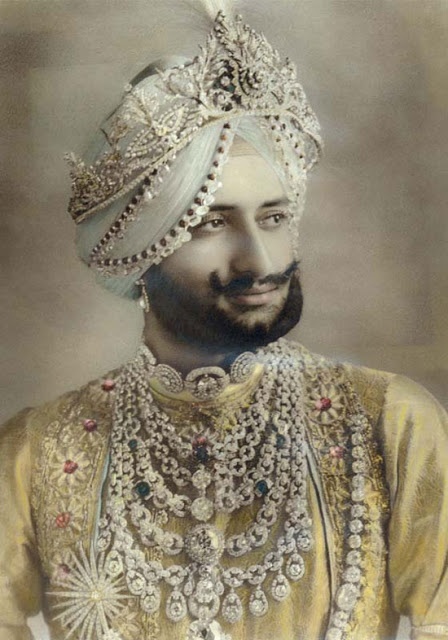 Unlike the European courts where women wore the most splendid jewelry, in India the male rulers, the Mughal emperors, the maharajas, nizams, and sultans, wore the most significant pieces in dazzling amounts on ceremonial occasions. The Indian male rulers wore jewelry in great profusion as necklaces, armbands, bracelets, and even anklets, signifying their high rank in society. When the Mughals arrived on the subcontinent in the sixteenth century, they brought Persian and Islamic influences to Indian jewelry. 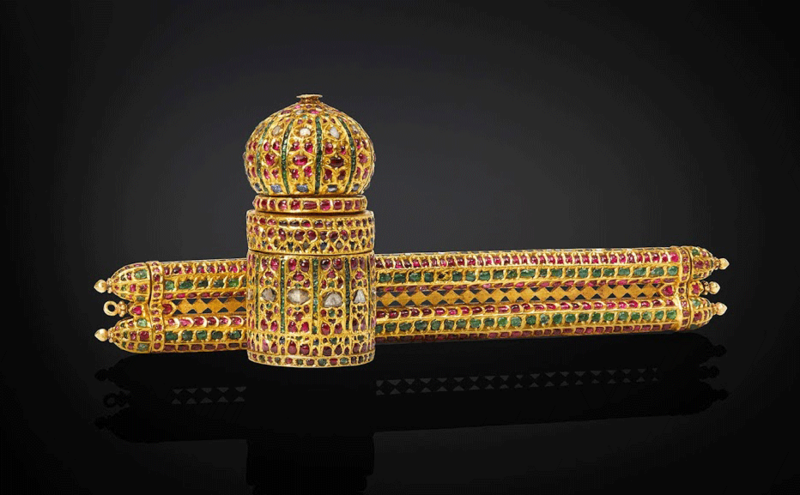 This effect can be seen in the several turban ornaments on display, which show how Persian ideas were realized in diamonds, rubies, and emeralds for the Indian rulers. 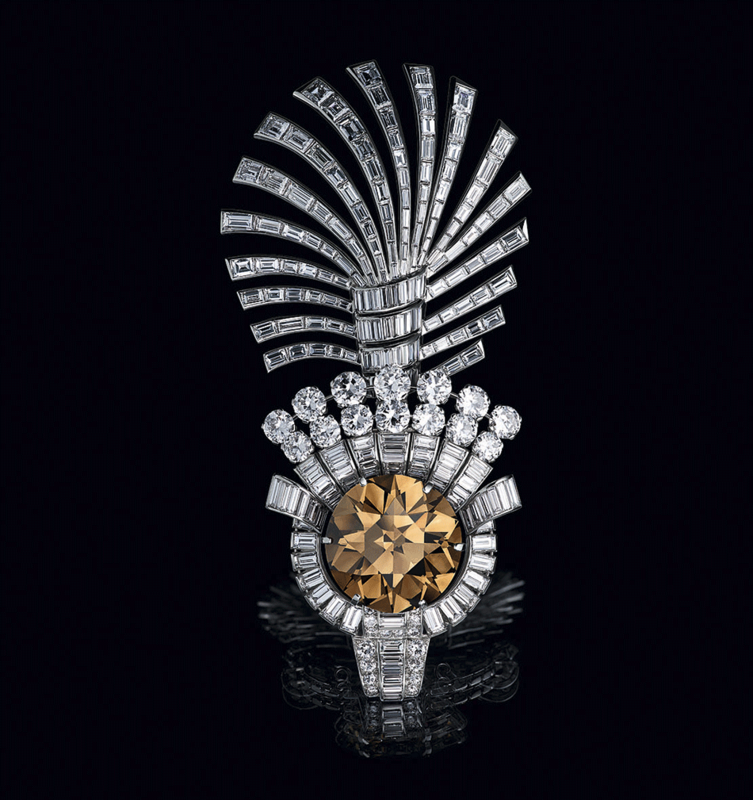 India served as a principal resource for diamond trade, providing the world’s greatest diamonds. 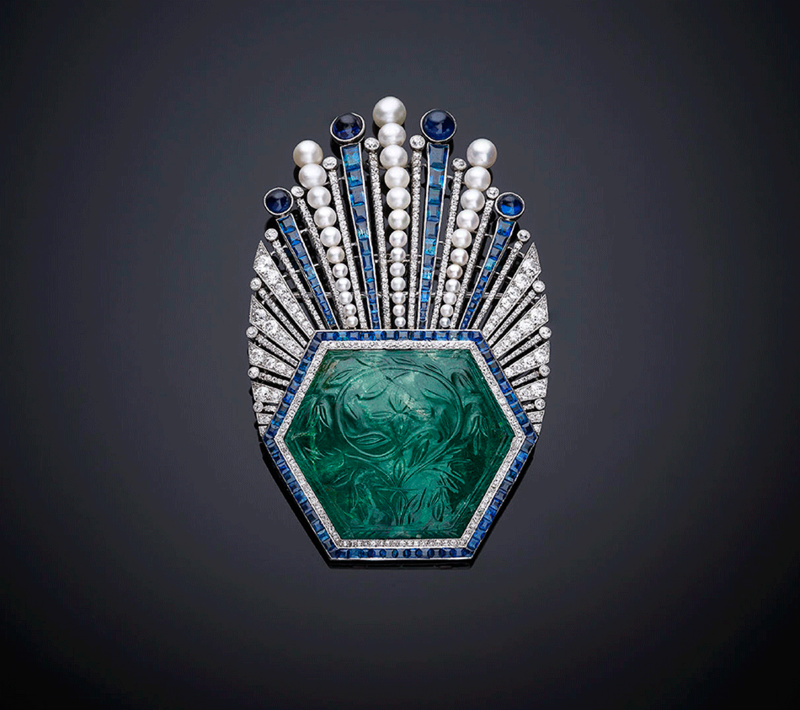 Visitors will grasp firsthand the prestige of India’s diamonds upon seeing the Idol’s Eye, a 70.2-carat diamond and the largest blue diamond in the world, the Arcot II (formerly owned by the Queen of England), and the vibrant pink Agra diamond, all shown in the exhibition. For a time, the importance and prestige of India was so great, that when the diamonds were discovered in Brazil, they were traded through it to give them credibility. The Europeans traded emeralds from Colombia in India, where they were cut and carved in the Mughal style to make them appear specifically Indian and many were adorned with inscriptions of spiritual texts or royal titles. 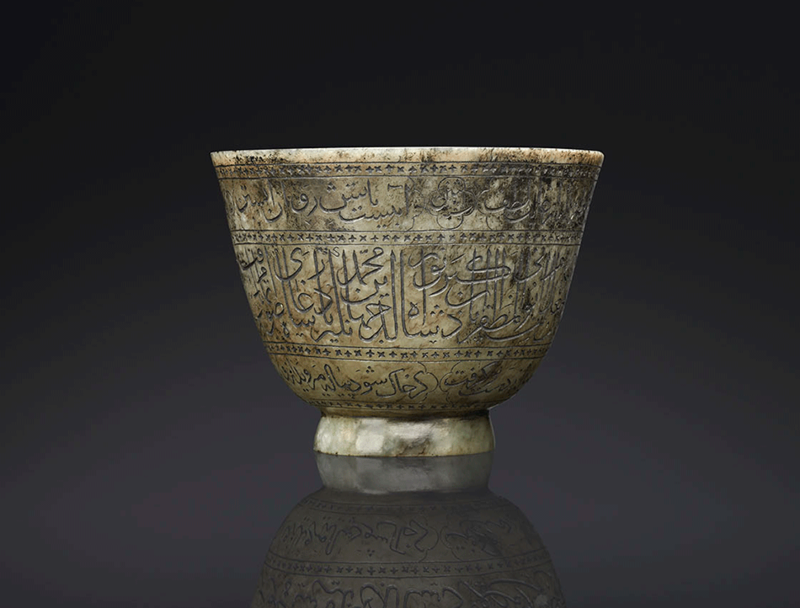 Other precious objects include jade, a hardstone that Mughal rulers associated with victory, fashioned into weapons such as daggers; the material was prized, moreover, for its curative powers and was therefore carved into cups and drinking bowls. Dagger belonging to Emperor Shah Jahan, builder of the Taj Mahal, hilt 1620–1625, blade 1629–1636. Jade (hilt) and watered steel (blade), length 11 11/16 in. (29.7 cm). Gold was also a favored material for physical expressions of royalty, seen in Indian jewelry up to the end of the nineteenth century and in precious ceremonial vessels. Objects set with the unique technique of Indian kundan, which consists of securing the gems together with strips of pure gold rather than with claws or tips, can be seen. 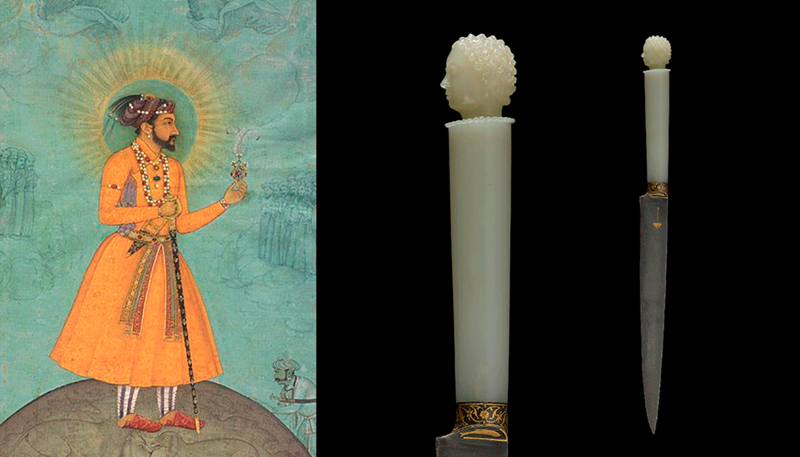 LEFT: Finial from the throne of Tipu Sultan, Kingdom of Mysore, ca. 1787–1793; plinth ca. 1800. Gold, diamonds, rubies, emeralds, and lac; plinth of black marble and gilt metal. Finial 2 11/16 x 2 1/8 x 2 3/16 in. (6.8 x 5.4 x 5.5 cm); plinth 4 1/16 x 3 15/16 x 3 15/16 in. (10.3 x 10 x 10 cm). Nizam of Hyderabad necklace, India, 1850–1875. Gold, diamonds, emerald, and enamel, 10 1/4 x 7 3/4 in. (26 x 19.6 cm) as mounted. 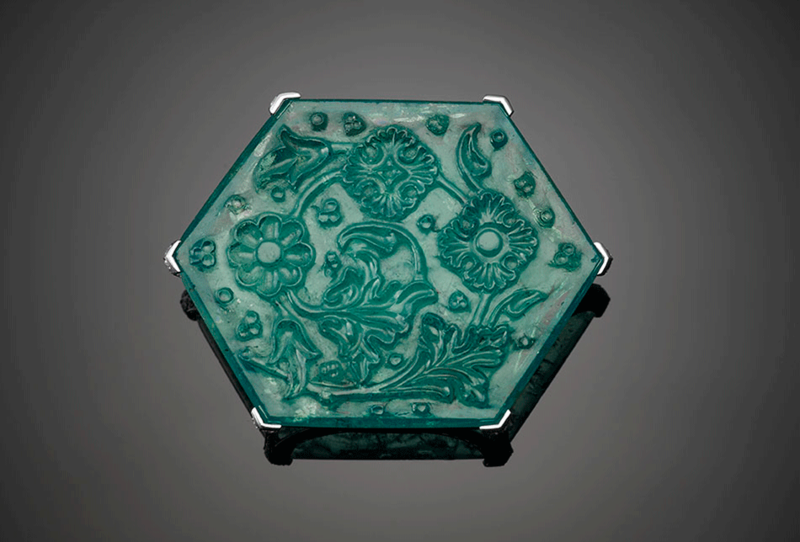 Pen case and inkwell, Deccan plateau or North India , 1575–1600. Gold, diamonds, emeralds, rubies, sapphires, and lacquer, pen case 1 9/16 x 12 1/16 in. (4 x 30.6 cm); inkwell 4 1/2 x 2 1/8 in. (11.4 x 5.4 cm). The use of pearl threads, which began in India as a custom for male rulers, is now found all over the world as a fashion for women. 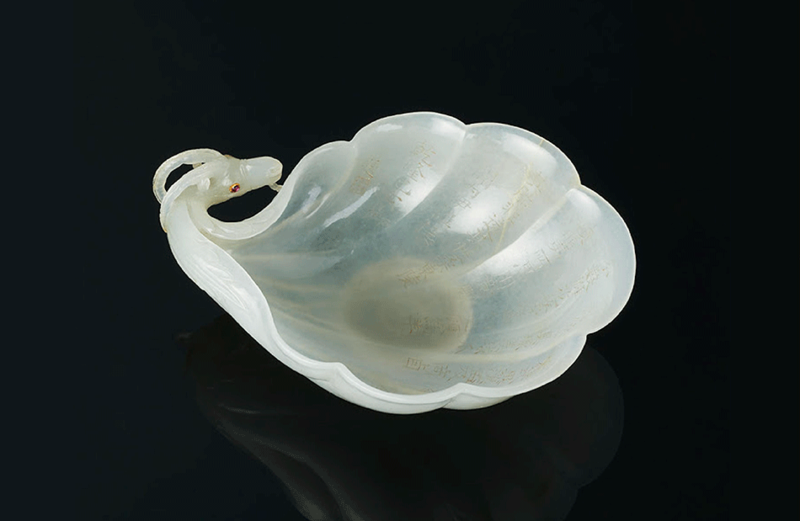 Rosewater sprinkler, North India, 1675–1725. Gold, rubies, emeralds, and pearls, 10 1/16 x 4 1/16 in. (25.5 x10.3 cm). 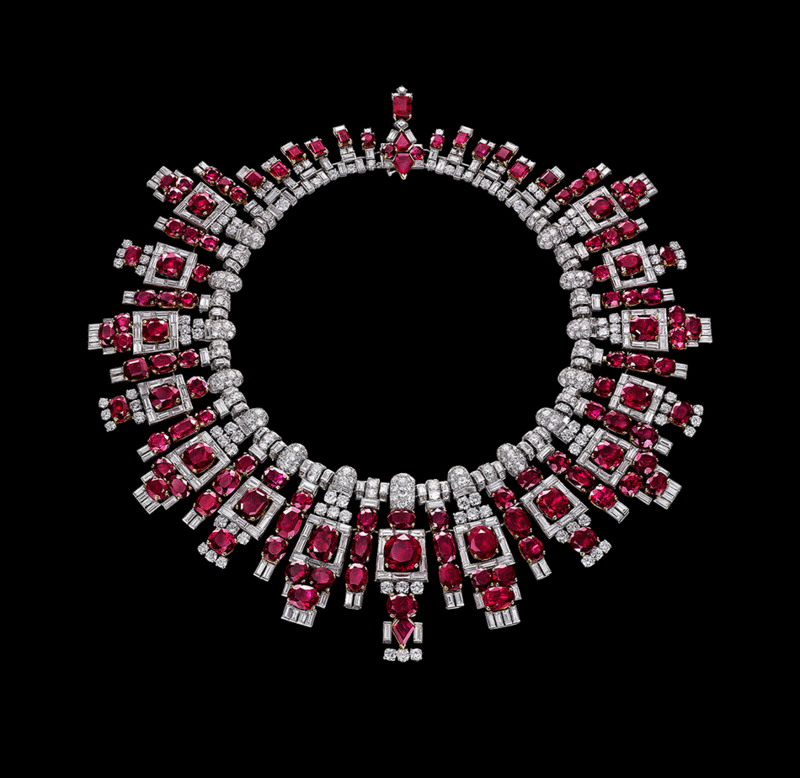 Nawanagar ruby necklace, Cartier, London, 1937. 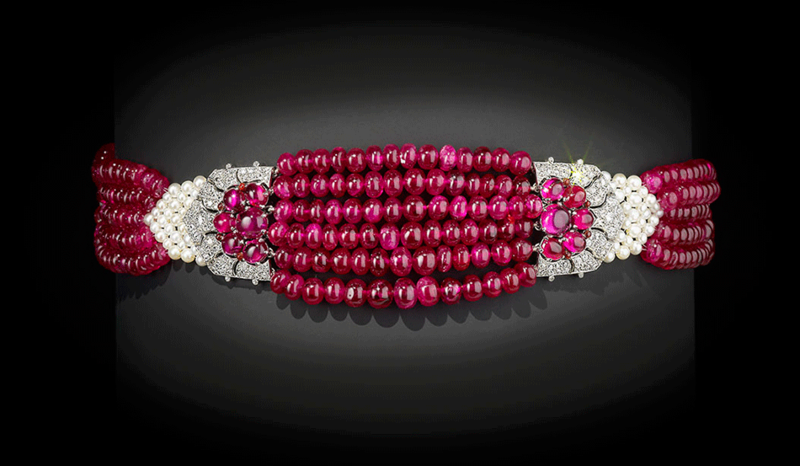 Platinum, rubies, and diamonds, 8 1/16 x 7 11/16 in. (20.5 x 19.5 cm) as mounted. 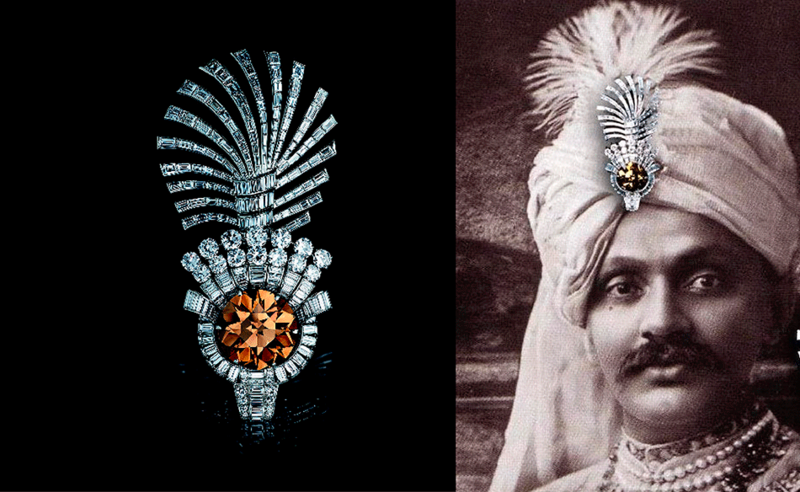 European jewelers like Cartier created some of the most spectacular pieces for the maharajas, who supplied stones from their own treasures. The results are hybrids, employing Western jewelry techniques but executed in traditional Indian forms. Patiala necklaces, for example, represent some of the most extravagant commissions given by a maharajah to a European jewelry store. 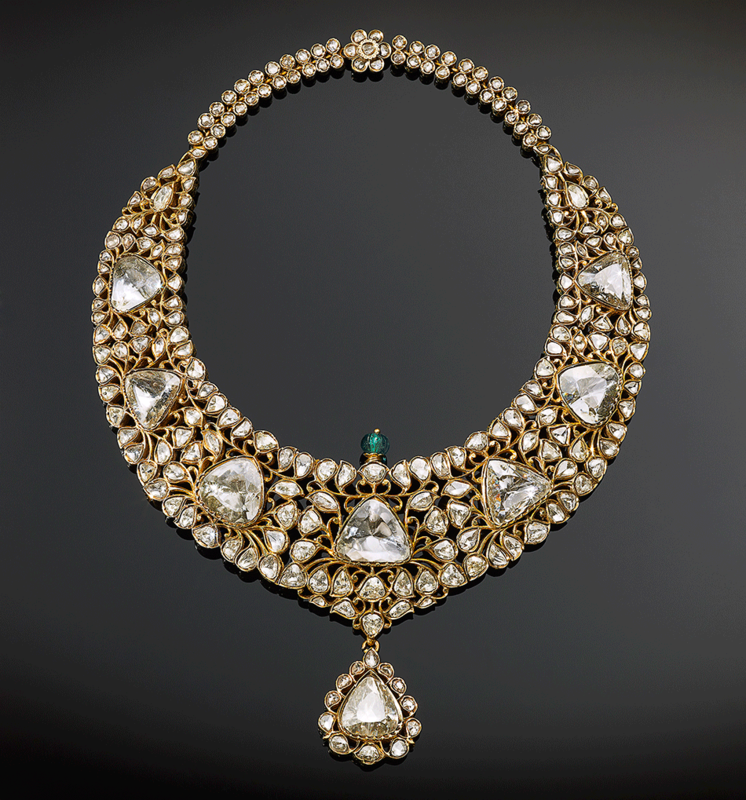 The necklace made to cover the maharajah’s chest contained more than three thousand precious stones, including the 234.65 carat De Beers diamond, the largest necklace ever made by Cartier at that time. 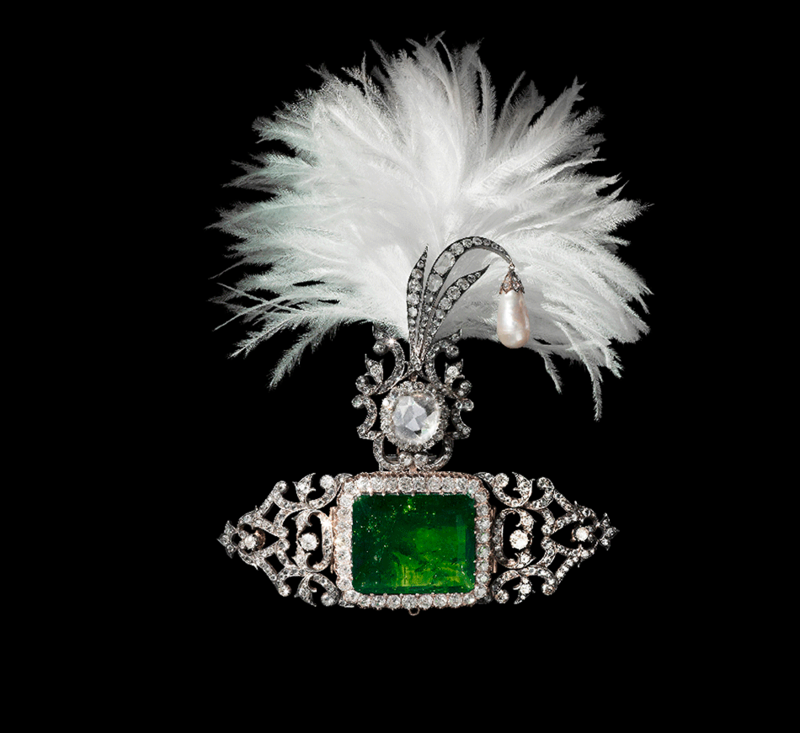 Other pieces exhibited by Cartier incorporate cut Indian gemstones, including emeralds and rubies, in a style known today as Tutti Frutti. 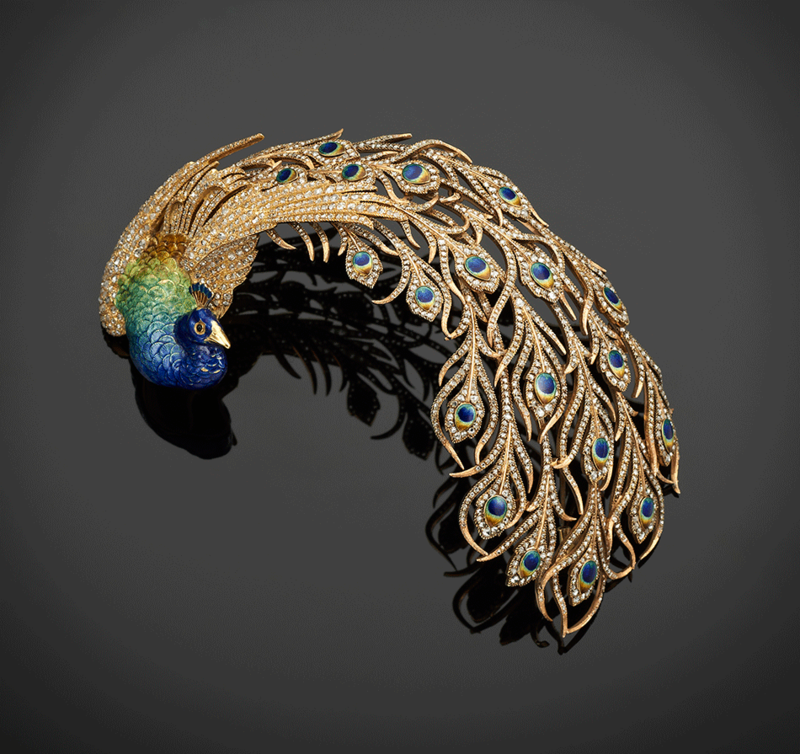 With remarkable pieces from Mumbai’s Bhagat and Paris’ JAR, it illustrates how Indian jewelry traditions have persisted in the hands of contemporary jewelers, giving us a vision of how East meets West today. Imperial spinel necklace, North India, spinels ca. 1607–1755, modern stringing. 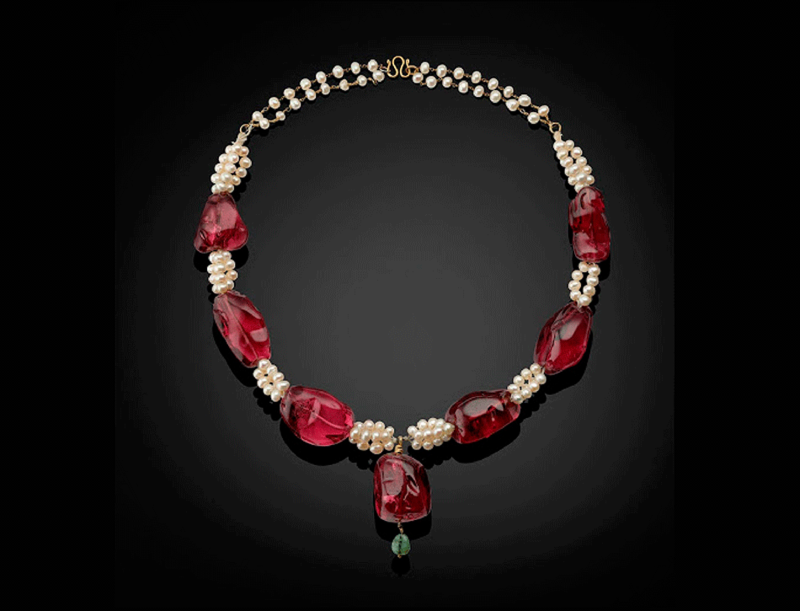 Spinels, pearls, and emerald, length 20 3/8 in. (51.8 cm). Aigrette, Robert Linzeler, Paris, 1910. Designed by Paul Iribe. Emerald, India, ca. 1850–1900. Platinum, emerald, sapphires, diamonds, and pearls, 3 9/16 x 2 1/4 x 9/16 in. (9 x 5.8 x 1.5 cm). FOTOS: © The Al Thani Collection. All rights reserved. Photography by Prudence Cuming Associates Ltd Image courtesy of the Fine Arts Museums of San Francisco.